The discussion about journalism’s future so often focuses on Big Changes — Kill the print edition! Flips for everyone! Reinvent business models NOW! — that it’s easy to forget how simple innovation can be. Sometimes all you need is a few Tweets, a bunch of links, and some like-minded pioneers. That’s how a quiet revolution began in Washington state Wednesday. Four journalists spontaneously launched one of the first experiments in collaborative (or networked) link journalism to cover a major local story. But it gets better. Those four journalists weren’t in the same newsroom. In fact, they all work for different media companies. And here’s the best part: Some of them have never even met in person. “The whole thing came together on Twitter yesterday morning,” Elaine Helm, new media editor at the Herald in Everett, said in an email Thursday. The story was crazy rain in western Washington: evacuations, flooded and closed highways, avalanches, a breached levee, the whole deal. 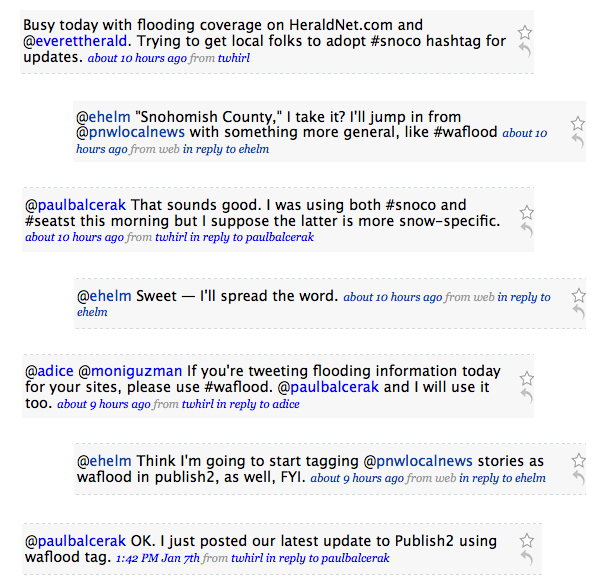 Elaine (@ehelm on Twitter), put a call out for local Twitterers to adopt a common hashtag for flooding coverage. Paul Balcerak (@paulbalcerak), assistant editor of dynamic media for Sound Publishing, suggested #waflood, which they agreed on and posted for their Twitter followers to see. That would have been innovation enough, but Paul went a step further: He saved links to flood coverage through Publish2, tagging each with “waflood,” and posted on Twitter that he was doing so. Soon Elaine, Angela, and Brianne were also adding links to Publish2 with a “waflood” tag. They then put Publish2 widgets on their news organizations’ sites that displayed the links they were collaboratively gathering, greatly expanding their sites’ coverage of the flooding. 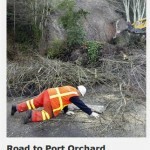 and the one at Sound Publishing’s pnwlocalnews.com (see “Washington state flooding” at the bottom). Voila — instant collaborative link newswire! This collaboration is remarkable in all kinds of ways. First, you can tell by the Twitter timestamps how quickly everything came together. Second, with a link newswire fed by multiple news organizations, there’s a danger that everyone might add only their own stories to the mix. But this group added outside sources as well (including the News Tribune, Seattle Post-Intelligencer, the Seattle Times, Yakima Herald-Republic, the Daily Record, and more). Third, all four independently and instantly “got” what the others were doing, which shows how much the ideas of collaboration and link journalism (and even the term itself) have spread. Lastly, did I mention the four journalists work for different media companies? The Herald is owned by the Washington Post Co., Kitsap Sun by Scripps, Sound Publishing by Black Press (of Victoria, B.C. ), and Wenatchee World is independent/family-owned. Paul hasn’t met Angela or Brianne in person, and has met Elaine briefly once. Yet none of that was an obstacle. I used to work with Elaine at the Sun and talk to her regularly, and she’s one of the reasons I joined Twitter. While I’d never done any project with Brianne before, she had made it a point to visit other papers around the region and introduce herself when she became the Wenatchee World web editor, which is how I started following her on Twitter. I met Seth Long [Sound Publishing's new media director] on Twitter, which is how I met Paul, neither of whom I’ve met in person. They both, however, work with a former co-worker and friend of mine. It’s a small, small online journalism world in Western Washington. How refreshing is that? Forget walled gardens — this is the spirit of journalism’s future. In some ways the networked linking process is an extension of how newsrooms collaborate with traditional wire services, but I think the Washington project is more than that. Papers using a traditional wire service aren’t really collaborating. They’re primarily trying to a) extend the reach of their stories, and b) get access to material they can’t afford to produce on their own. The Washington link projects should serve as models for the entire news industry. They show that collaborative linking draws readers, is easy, and costs nothing more than time (and not even much of that). I think it’s especially useful in situations like these, where events affect a large region. I can also see it being used as a way to track things like state government news, or any broad-reaching issue that your readers will be talking about. Having a group of people adding the links just makes your job that much easier. As both a reader and a web editor, I can keep updated on what’s happening on a particular topic without opening and slogging through a dozen web sites. This is the power of collaborative news networks. By forming a network, newsrooms can discover not just a greater volume of news, but a greater volume of relevant, high-quality news than one person, one newsroom, or one wire service could alone. Compare the Washington group’s great waflood link roundup to a Google News search for “Washington flood” — I know which one I’d rather have as a resource if I lived in that area. That’s it! Any group of news organizations can do this, even if they’re not Twitter-friends. A good way to start is to set up a Publish2 newsgroup and invite other journalists (as Angela did with a Northwest News newsgroup in December). Collaboratively save links about a couple of non-breaking-news subjects to get a feel for it, and try publishing feeds of those links. Then when a big story breaks, it’s a simple matter of choosing a common tag and alerting everyone in the newsgroup. I think it’s worth pointing out that everything we did today cost us $0. That, too, is the spirit of journalism’s future. I can’t wait to see what this innovative crew cooks up next in that spirit — and who will be the first to follow their lead.